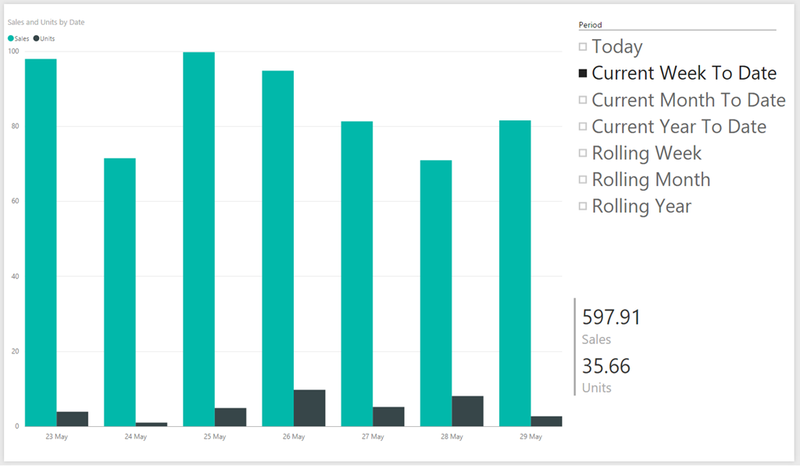 One very common requirement when creating a Power BI report is the ability to apply a filter for the current day, week, month, quarter or year. There are several ways of implementing this: you could add relative date columns to your Date table as I show here (I used DAX calculated columns but you could also do this in M quite easily too); you could also build the filter into the DAX for your measures, although that could mean you end up with a lot of quite complex measures. Last week I received an email asking for help with an interesting variation on this problem: how can you create a report with a single slicer that allows you to switch between showing data for the current day, week, month or year? The requirement to have a single slicer is important here: if you create new columns on the date table, that would allow you to have a single slicer that allows for selecting the current day or any relative day, or the current week or any relative week, or the current month and any relative month, or the current year and any relative year, but it wouldn’t allow you to select weeks, months and years together in the same slicer. It’s the Period column on this table that is used to create the slicer in the screenshots above. 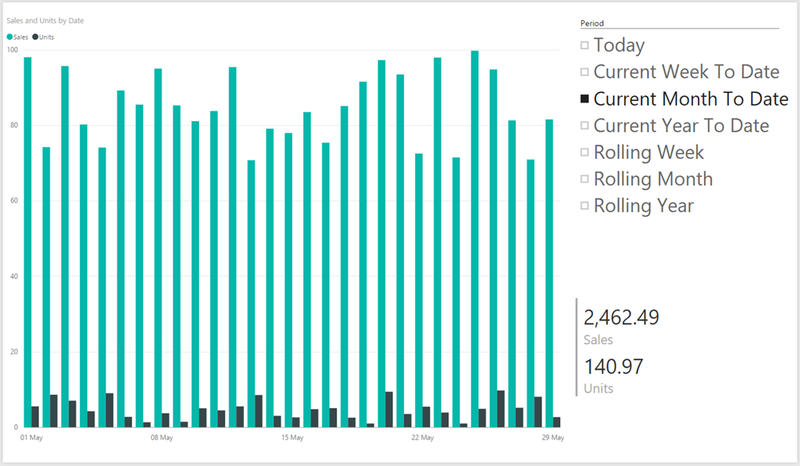 The Sort column is used along with Power BI’s Sort By Column functionality to make the values in the Period column appear in a sensible order in the report. 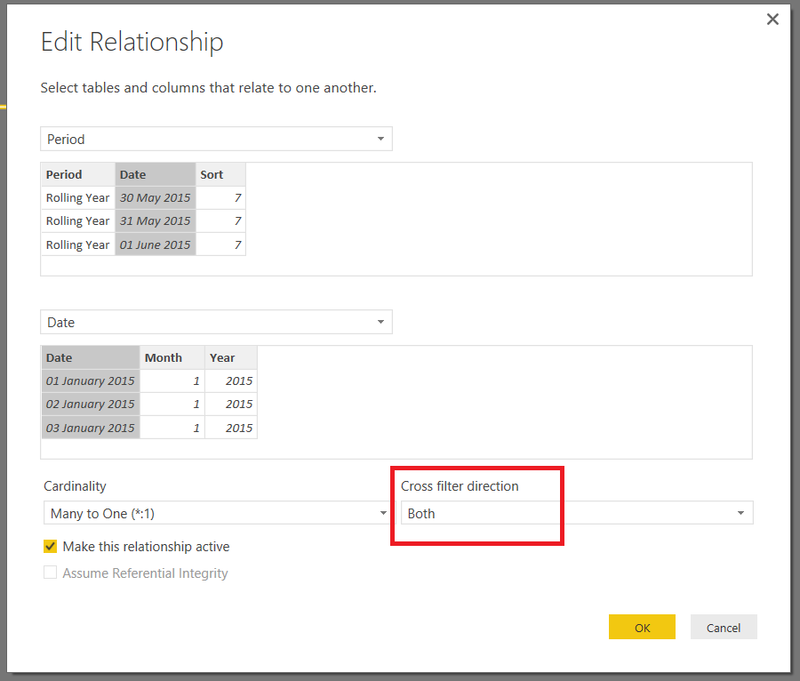 This means that a selection on the Period table travels up the relationship to the Date table and then back down the relationship from Date to Sales. For example, selecting “Current Week” in the Period table will select the dates in the current week on the Date table, which in turn selects the rows for those dates on the Sales table. In this query the Ranges step contains a list of lists, where each list in the list represents a time period with its start and end dates in the same order that you’d pass these values as parameters to the CreatePeriodTable() function. I’ve deliberately structured the code to make it easy to add new time period to the list. Hopefully the example time periods in the query above give you a good idea of what’s possible in M and all the functions it gives you for calculating different dates. The GetTables step loops over this list and calls the CreatePeriodTable() function for each list in the list, and the Output step combines all the data into a single table. All of the dates ranges here end with today’s date, as returned by the DateTimeZone.FixedUtcNow() function, but you may want to check out Ken’s post here on handling time zones in M depending on your exact requirements. Because this happens in M when the data is loaded the value of today’s date will be fixed at the point in time that data refresh took place. You can download the example workbook for this post here. Thanks for this excellent post Chris! Yeah i was amazed too. This is a great post on a challenging topic. I have a question about the case where a user selects more than one value in the period selection (e.g. Week to date and month to date). Will the sales numbers for the current week be doubled (for the dates that are in both selected periods)? If it isn’t doubled for these dates, is that a feature of the bi-directional join or the model structure? If It is doubled, is there a way to prevent it? I understand the logic here but am stuck with some newbee’s questions. Where do you create the function called “CreatePeriodTable” in PBI ? Where/how do you create the subsequent Method to generate the table based on the boundary dates ? I am guessing that at some point it should be triggered by the slicer’s item selection but this is not obvious to me. If this is, could you please give an advice on where I should land on (basic tutos or whatever would be much appreciated). This is really really interesting. In reality every date will be considered only once in the DAX query, so the values will not double because the same date is present in multiple periods – but the problem exists if you make an inconsistent choice, such as current week + current month, or current month + last year month –> in this case, you would consider the set including all the days that appears at least once in each period. The HasOneValue protection suggested by Chris is the best practice in this case. 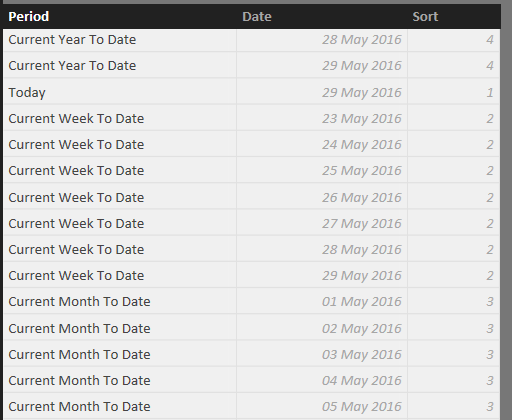 Interestingly just opened the .pbix file today Tuesday 31/05/16 and noticed the ‘Current Week to Date” sales figures started as of yesterday Monday 30/05/16. If you wish to start your week on another day, say a Sunday then add the optional FirstDay argument to this function. Chris does the M function Date.StartOfWeek default the FirstDay argument to value = 1 ?ie Monday ? Can you confirm that Is right ? Yes, that looks right. I guess it defaults to Monday being the first day of the week because that’s how it is in the US. Great article. Thanks for this Chris. Very cool, never used a bi-direcional filter that way. Thanks for the M-Query, next time i will use it. Is there any way to replicate this functionality in Excel 2013 Power Query/Powerpivot? I notice there’s not the Both directions filtering option…. If I just have my calendar table lookup in the period table and use that as a slicer on a third table that has a relationship to the calendar table, I get the “Create a relationship?” dialog and Excel doesn’t know what to do. I would add that in Excel 2016 it is more efficient using CROSSFILTER function – you use the same feature used by Power BI when it uses crossfilter. We have to update our articles and whitepapers just for that 🙂 but I will write an article soon explaining that. I really love this – I’ve used it on a couple of reports now and have added some of my own date periods to the list. I’m new to Power Query and Power BI though and I wonder how I would do this for financial year (ending 30/06), e.g. Current Financial Year to Date. Apologies if this has already been covered. This is awesome. I changed the queries a bit for me so as to just provide MTD, QTD, and YTD. Thank you so much! My only question is, how would I pass the selection from this slicer into a measure that would pull the Prior Year date range/values as well. I don’t want to show PY MTD, QTD, or YTD in the slicer, I want to show the PY measures side by side with the current year measures in the report so that I can show the end user year over year variances. My only idea was to use the parameter table technique described by Collie and the Italians. But is there a simpler/better technique? this approach that you are suggesting seems not to be working for me. I’m using your “Month to Date” option from slicer and have to measures, “Sales” and “Sales PY”. For the “Sales” it shows correct number but for the “Sales PY” it’s just blank. Any thoughts? Should I use some different approach? Bruno: I was able to get this to work. What I had to do was use Chris’ method to create a second column in the Period table that shifted the year back one, thus creating a Prior Year column (I handled the leap year issue by making 2/29/2016 relate to 2/28/2015). From here, I created two relationships, both bidirectional, between the Period table and the Calendar table. The active one between the original date column from the period table and the date key in the calendar table. The inactive one between my newly created prior year column of the period table and the date key in the calendar table. Downstream, the calendar table has one relationship This makes the DAX very easy. The Current Year measure is SUM([Sales]). The Prior Year measure is CALCULATE(SUM([Sales]),USERELATIONSHIP(‘PERIOD'[Prior Year Date],’Calendar'[DateKey])). That’s it. Andrew: Great idea. It worked perfect, thanks a lot. Chris: Thank you for your suggestion also. One challenge I ran into with the inactive relationship workaround (and maybe I’m doing something wrong?) is that the prior year amounts are being associated to the prior year dates. So, instead of being able to look at yesterday and see the PY sales side-by-side, there’s a 364 day gap between the number for yesterday and the number for yesterday last year. I could add prior year periods as periods so the end-user can flip between this year and last year (which doesn’t solve the side-by-side problem but eliminates the gap). For now I’m using the parameter table technique, which works well but requires each measure to be set up. This technique caught my attention because it would work for all measures out of the box. Great solution! 🙂 But I am not sure how you made the LY / PY input/column so it work just like the solution Chris made. Is there any chance you can describe it a bit more? Is it possible to do this using direct query mode? I’ve read that bidirectonal cross filtering isn’t currently supported. Without this, it looks like it will be hard to add any form of relative calendar. Very interesting post, but, What’s happend if we’ve a direct connection to a SSAS Multidimensional? This doesn’t work with a direct connection to SSAS Multidimensional, but you could easily recreate the same functionality inside SSAS in a number of different ways. 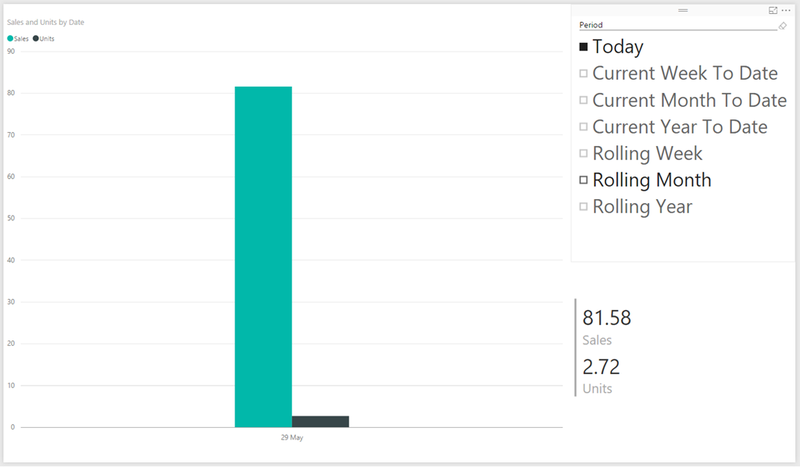 Thanks Chris, but, Is it possible to get a SSAS multidimensional connection, and show the info for the current year in the Power Bi report? You can then select the “Current Year” member on this attribute in your reports. Chris – you are throwing us newbies into the deep end! Any directions on how to setup the two functions ? How is this actually implemented on PowerBI desktop ? Sorry not to reply sooner – it’s been a busy week. Glad you figured it out! GREAT post !! Many thanks.!! Any ideas about which expressions to add new time period to the list such as: Yesterday AND quarter to date ? This has helped my reporting immensely – so thank you. However, I have a series of measures that calculate net gain/loss over periods selected by the slicer and am having difficulty calculating the ‘start point’. In your sales example, if I were to select current week to date how would I calculate the total sales and units up to – but not including – the start of the current week? Would it work with Direct Query? No, I don’t think you’ll be able to use this exact same approach, but there’s no reason why you couldn’t recreate the tables that I’ve constructed in M but using SQL. CalendarAuto to the rescue and Abracadabra! thoughts? Looks good to me. I guess it comes down to whether you prefer writing M or DAX. GREAT post !! Many thanks.!! I truly love this – I’ve utilized it on a few reports now and have included my very own portion date periods to the rundown. I’m new to Power Query and Power BI however and I consider how I would do this for a budgetary year (finishing 30/06), e.g. Current Financial Year to Date. Expressions of remorse if this has just been secured. I know this thread is older but I’m looking to find out the Previous Week Dates using this method. Can you help with that Chris? HI. I can’t download the example workbook. Is it still available?